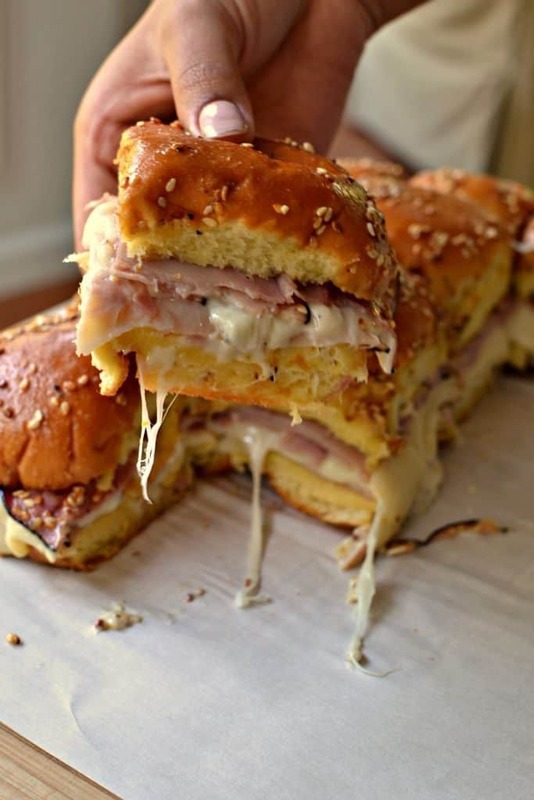 These Ham and Swiss Sliders are party perfect, easy to prepare and oh so delicious. Melted Swiss, sweet ham, and creamy Dijon mayo combine to make these sliders the hit of any celebration. The holiday entertaining season is approaching fast. Are you doing anything special for Halloween? Are you planing a large shindig for Christmas or the New Year? Do you have your buddies over to enjoy a Sunday football game? 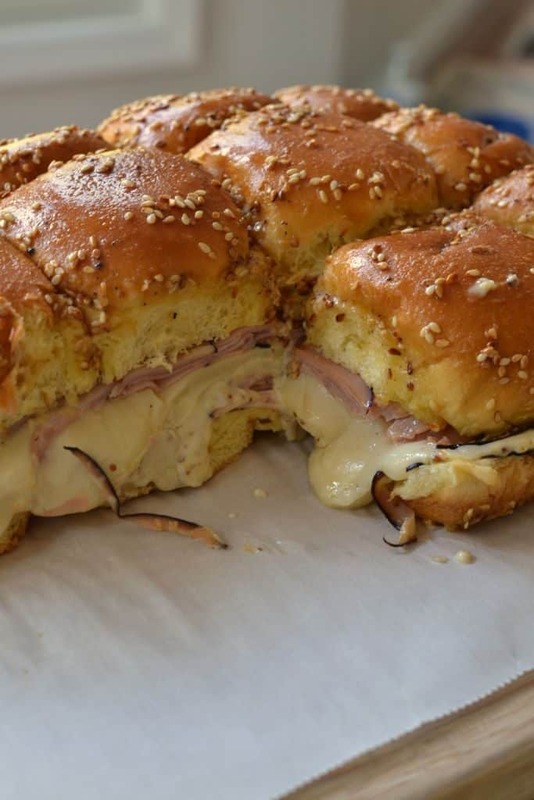 These Ham and Swiss Sliders are perfect for all of those occasions. They are so tasty and easy to prepare. They are layered with Dijon mayo, sweet ham, and nutty Swiss but you can modify the sandwiches to suit your taste. The basic premise is to make party sliders that are easy to prepare, delicious, and that please you and your guests. Entertaining can be so much fun if the food, cocktails and ambiance are thought out in advance and planned accordingly. What substitutions are there for Ham and Swiss Sliders. If you don’t think all your guests will like Ham and Swiss Sliders and then make some slight modifications. Suggested add ins for Sliders. How to make Ham and Cheese Sliders. Begin by combining mayo, mustard and honey. Using large serrated knife slice sliders in half horizontally. Spread Dijon mayo over bottom and layer with ham, Swiss and more ham. Then cover with top half of rolls. Right before placing in the oven melt butter and add mustard, Worcestershire, pepper and toasted sesame seeds. Generously brush the butter mixture over the top of the rolls. Cover with foil and place in preheated oven for twenty minutes or until the cheese is melted and the rolls are warmed through. Remove foil the last few minutes of cooking to brown the rolls just a touch. 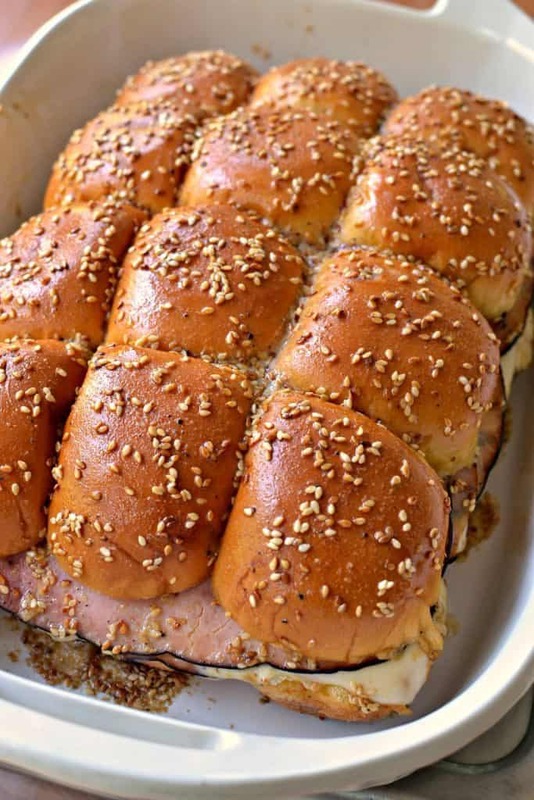 What kind of buns are best for Ham and Swiss Sliders. I have used all kinds of 12 count buns for this recipe with great success. 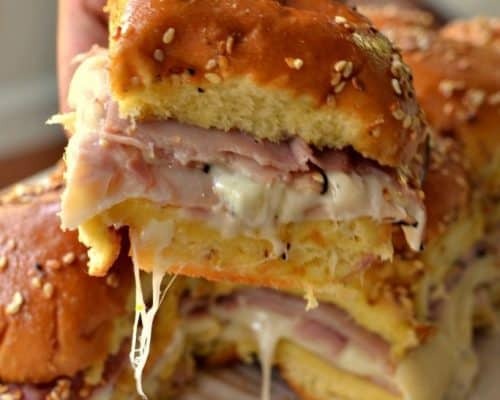 These scrumptious Ham and Cheese Sliders are the perfect party food. They are amazingly easy, delicious and dependable. Other party foods you will love! Melted Swiss, sweet ham, and creamy Dijon mayo combine to make these easy Ham and Swiss Sliders the hit of any celebration. In small bowl whisk together mayo, 2 tablespoons Dijon mustard and honey. Using large serrated knife slice sliders buns in half horizontally. Spread Dijon mayo over bottom and layer half of the ham, Swiss and the remaining ham. Cover with top half of rolls. Toast sesame seeds in a dry skillet over medium heat for about 3 minutes; or until lightly browned. Stir frequently. In small microwaveable bowl melt butter. Stir in 1 tablespoon Dijon mustard, Worcestershire sauce, pepper and toasted sesame seeds. Brush over the top of the rolls. Cover with aluminum foil and bake at 350 degrees for 20 minutes or until the cheese is heated through and melted. Remove the aluminum foil the last few minutes of baking to brown the tops lightly. Remove from oven and slice through rolls and serve. Add sour kraut and you have an amazing Rueben sandwich.